How do you get that perfect anklet size? Sizing ankle bracelets so they fit and drape just right can be really tricky and more than a little frustrating. Here are some tips and tricks for getting the perfect fit. Ankle bracelets are commonly about 7 to 10 inches in length. Remember that these sizes are guidelines only. If you are making a simple chain anklet (like the chain anklet project here), you can go by these typical sizes. If your anklet is made of beads, larger beads will affect the optimum length because of the drape factor. Chunky beads will mean a longer length. Tiny beads will mean a shorter length. Take a piece of non-stretchy string and encircle your ankle snugly (but not tightly). Measure the string, then add about a 1/2 inch. 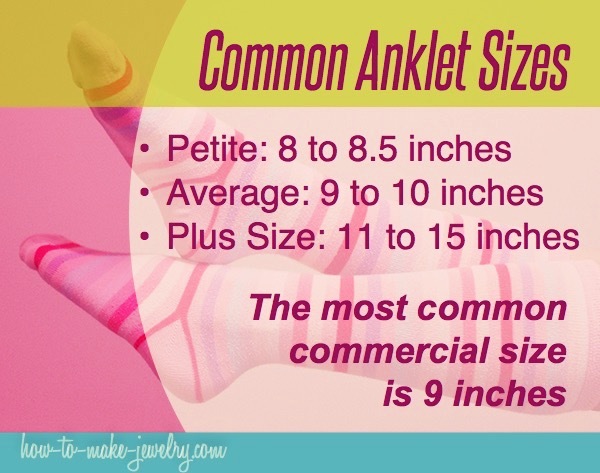 This will give you a pretty good size estimate for an anklet that falls below the ankle bone. If you are using larger beads, you will need to add some extra length to compensate for the extra bulk of the beads. The easiest way to make sure you size correctly is to measure as for a chain anklet then test the sizing after you have strung your beads, but BEFORE you finish off the ends by test measuring around your ankle. To test measure for someone else, try to get a measurement surreptitiously (like when they are asleep) and then use the measurement to make a tube out of cardstock. Pretend that's your ankle and drape the unfinished ankle bracelet around your pretend ankle. I always find getting the length of an anklet or bracelet tricky. If you do too, you might want to use a necklace extender or chain so you can adjust the size. 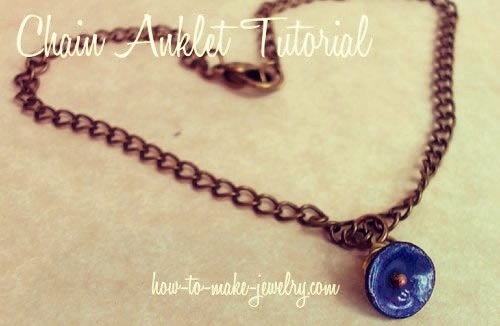 Adding a necklace extender to a piece of jewelry is pretty easy. Just be sure to use something secure to attach it to your anklet. Using a single jump ring is not a good idea because the jump ring can easily pull open if your anklet gets snagged on something. (Necklaces don't get as much abuse so often a jump ring is all you need). Instead of a jump ring, you should use split rings or make a wrapped loop.